We pride ourselves on the speed of of our service, the price of our testing, and the accuracy of our results. Something we rarely speak about though is the existence of profiles for a wide variety of exotic botanicals and entheogens such as Kratom, Kava, Wild Dagga, Blue Lotus and Blue Lily, Kanna, Akuamma, and many others. Profiles are the “fingerprints” of tests that we’ve completed in the lab. Every single sample, even if it’s from the same species, is like a snowflake. Every snowflake is different from the next, and the same is true for every sample of material given to us for testing. Because we specialize in exotic botanicals, we have built up quite a profile of materials over the years. Take Kratom, for example. We have tested well over 3,000 samples of Kratom (Mitragyna speciosa) for alkaloid content, adulterants, biological pathogens, and heavy metals. Although each sample from an individual plant variety has a unique fingerprint (or profile), there are enough similarities to be able to see different varieties within a species, and between sample sets. With Kratom, there used to be just a few varieties we’d see in the lab. There was your basic Bali and Maeng da varieties. Over time and numerous tests, we started to see a similarity between different varieties, and were able to generate a profile for each individual variety. We could see the markers that were common between different batches and harvests of Bali leaf. We could see similar markers emerge from different batches and harvests of Maeng da. And, we could see material that was posing as either Bali leaf or Maeng da. Over time, more and more varieties of Kratom began to appear. There was Kratom from Borneo and Malaysia, there was Kratom called Hulu and Horn, and a number of varieties in-between began to appear. Then, like tea that’s harvested at different times, we began to see colors assigned to these varieties as well. We began to see Green Maeng Da and Red Bali. We began to see Green, Red, and White Horn, as well as Green, Red, and White Borneo, and the list goes on. We couldn’t help wondering if all of these different varieties were actually different varieties, so we began to compare all the tests. What we found wasn’t as shocking as you might think. Many samples we had tested did have unique signatures from one another. But then, many samples we received didn’t look anything like the profile they were supposed to look like at all. More than most other leaf, we have tested material that was supposedly Borneo, that actually looked an awful lot like Bali leaf. We found a lot of material that was supposed to be Maeng da, that not only had a very low alkaloid content for typical Maeng da, but it looked a lot like Bali leaf. We don’t blame any suppliers for this difference, and without personally going out to a forest and harvesting leaf ourselves, it’s impossible to say that whether the common markers we’ve seen with different varieties of Kratom over years of testing are as accurate as we are quite convinced they are. Fingerprints are fingerprints, and even with plants, there are enough differences between distinctly different varieties, to make any determination more than just a random guess. With that, I can say that we have found a wider variety of Kratom leaf than we originally expected. When we first started looking at common markers, we expected to see just a few different varieties of Kratom leaf being given a number of different names. We found that there are actually a wide variety of varieties of Kratom, and that Kratom that is supposed to be from different regions actually looks different from region to region. The best we can do is call a variety a reference when we are sure of the origin of the material. Only then can we comfortably say that our profile for Green Maeng da is actually Green Maeng da, or that the Bali leaf we just tested is actually Bali leaf. I’m endlessly fascinated by plants, and Kratom in particular is of great interest to me. To see so many different varieties pop up out of seemingly nowhere, to see so much fraud in the marketplace and both suppliers and customers being taken advantage of, I hope that our small contribution is offering peace of mind not only knowing the alkaloid content of your material, but trusting that the variety of Kratom you’re being told it is, actually tests out in the lab to be that variety. 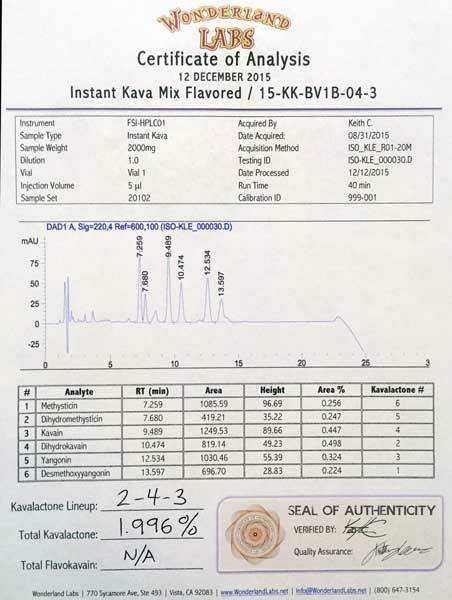 Lab tested Kratom not only brings peace of mind, but we’re finding that suppliers who provide their clients with lab tested Kratom not only see increases in sales, but can ask for more money for the varieties that come up with unusually high mitragynine content or 7OH content.